March 7th, 2012 - Toyota Material Handling, U.S.A., Inc. (TMHU) announced today their top Toyota Dealer Technicians and Toyota Dealer Technical Trainers with the Platinum Level Master Technician Award and the Platinum Level Toyota Certified Trainer Award, respectively. Each year, TMHU provides a knowledge test available only to Toyota Gold Level Technicians. This year, 11 Toyota Technicians and three Toyota Certified Trainers (TCTs) earned the Platinum Level Award. The test consists of more than 300 questions related to the service and maintenance of Toyota lift trucks. Toyota presents the Platinum Level Master Technician Award and the Platinum Level Toyota Certified Trainer Award to the top 10 percent of those who participated from each group. TMHU dealers employ more than 2,200 Toyota forklift technicians. In 2007, 45 percent of service technicians at Toyota Industrial Equipment dealerships were Toyota Master Technicians. 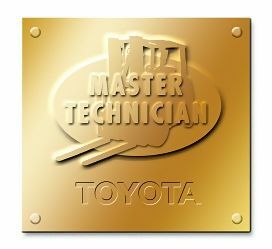 Now, more than 75 percent of Toyota forklift technicians have reached Master Technician status of Bronze, Silver or Gold level, through Toyota’s Master Technician Technical Training Program. TMHU Technician training is one of the most vigorous in the industry requiring dealer technicians to complete not only Toyota forklift-specific training, but also Automotive Service Excellence (ASE) certification. TMHU was the first lift truck company to require ASE certification. In addition, to achieve Bronze Level requires a minimum of two years working at a Toyota Industrial Equipment dealership along with the completion of several training courses. The other subsequent levels (silver, gold) require three to five years of working experience at a Toyota Industrial Equipment dealership and additional training courses. Paul Tassoul – Conger Toyotalift, Neenah, Wis.
Steve Forgette – Conger Toyotalift, Green Bay, Wis.
Eric Howland – First Access Material Handling, Batavia, Ill.
Anthony Gonzalez – Toyota Material Handling Northern California, Hayward, Calif.
Vance Linse – Toyotalift Northwest, Clackamas, Ore.
Craig O’Dowd – Toyota-lift of Minnesota, Brooklyn Park, Minn.
Anthony Kozub – Conger Toyotalift, Green Bay, Wis.
Max Welter – Toyota-lift of Minnesota, Brooklyn Park, Minn.
Roger Rybacki – Conger Toyotalift, Green Bay, Wis.
Teddy Castleberry – Kenco Toyota-lift, Chattanooga, Tenn.
Eric Nelson – Toyota Lift of Minnesota, Brooklyn Park, Minn.
Keith Blodgett - Toyota Material Handling Northern California, Hayward, Calif.
Bob Malingowski – Conger Toyotalift, Neenah, Wis.
Each Platinum Level honoree received a certificate and a monetary award card. In addition, a plaque bearing their name, dealership and years of service will be displayed in the Platinum Level display case located at the TMHU National Training and Customer Center in Columbus, Ind. Celebrating 45 years of established operations, Irvine, Calif.-based TMHU is the supplier for the No. 1 selling lift truck in North America since 2002. In addition to the full line of high-quality lift trucks sold under the Toyota brand, the company’s extended industrial equipment solutions include Automated Guided Vehicles and tow tractors. Toyota's commitment to excellence in customer service extends throughout the U.S. and Canada. With more than 70 authorized Toyota Industrial Equipment dealers and more than 220 dealership locations throughout North America, Toyota dealers offer comprehensive customer service and support, including one-stop shopping for both new and used lift trucks, rentals, parts and service, fleet servicing and financing. For more information on TMHU, please visit www.toyotaforklift.com, www.facebook.com/ToyotaForklift or twitter.com/ToyotaForklift or call 1-800-226-0009.